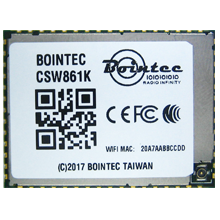 Bointec CSW861K is a low-cost, low-power consumption IOT module with Access Point(AP) and router function. With integrate Wi-Fi single chip solution, CSW861K supports IEEE 802.11b/g/n stream, providing GPIO for intelligent control, and UART interfaces for device communication. This completes networking platform enables any kind of electronics to add full-featured Wi-Fi to a wide variety of products with minimal development effort and cost. CSW861K supports a network stack along with SSL security, enabling full-featured internet connectivity and reliable information exchange in a small, low-cost system. CSW861K integrate PCB has one MHF4 antenna connector and 32Mbits flash RAM. 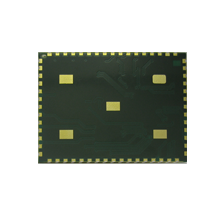 With an external power manage MCU, it is able to utilize 3.3V power source for best power consumption.